What can you do in July, the height of the tourist season, when you’ve been suddenly kicked out of your house in Klamath Falls, Oregon, and you need someplace else to stay? Due to extreme water damage, our contractor insisted that we move out for a couple of weeks so he could begin extensive repair work. “At the last minute, during the height of vacation season?” we asked. “A hotel with available space won’t be easy to find!” This was high adventure, all right, but not the kind we welcomed! A trip to the Oregon Coast would have been fun, but the best rooms had been reserved weeks ahead. Nearby Crater National Park Lodge, overlooking a stunning view of the lake, was completely sold out for the summer, as usual. There’s a nice hotel in our hometown of Klamath Falls, but due to an upcoming air show, there were no vacancies anywhere in town. Ted went to work on his computer and came up with an unexpected suggestion. “But it’s in in the nineties there this time of year, “I objected. He reminded me that the temperature in K. Falls was also in the nineties. “Don’t worry! I’ve worked out a leisurely drive on country roads” he explained. “There’s some great scenery along the way and we’ll take our cameras.” I had run out of objections. As we were packing and getting ready to leave, the contractor and his crew were literally taking the kitchen, the downstairs bathroom, and my office to pieces. By the time we were ready to go, the kitchen floor, cabinets, counters and appliances – even the kitchen sink, had all disappeared. Pieces of material from the ceiling were hanging down dejectedly. Plumbing was gone, and the furniture from my office was nowhere to be seen. All the kitchen drawers, still full, were piled on top of each other in the living room. Yikes! Wishing we hadn’t have to have been involved in all this chaos, we beat a hasty retreat. It was a beautiful day for a drive in the country. Taking Highway #97 with its always-amazing view of 14,000 plus ft. Mt Shasta, we made a lunch stop in Mt. Shasta City, with its many outdoor restaurants and new-age crystal shops. Then we stopped at McCloud to snap some photos of the south side of Mt. 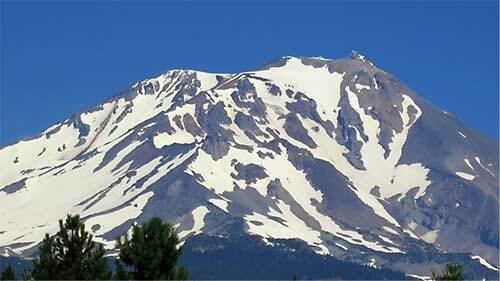 Shasta. View of Mt. Shasta from McCloud, looking north. As we drove on, we viewed Mt. 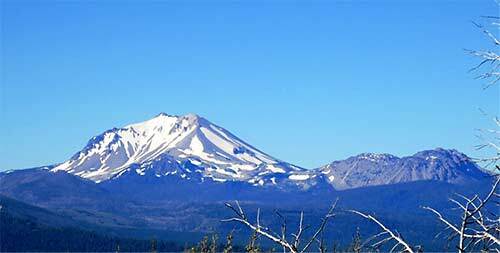 Shasta from several different angles – it was providing intriguing camera stops. Sylvia and Ted on Gray Butte after a lengthy hike, Mt. Shasta in the background. We continued on Highway 89 south to the tiny hamlet of Old Station, where we turned east on Highway 44 to climb the escarpment. There we found a paved turnoff to the Hat Creek Rim Overlook, with its awesome views of the north side of Mt. Lassen. The other visitors at this viewpoint were from Utah, and had read about this overlook, while we, ourselves, had stumbled upon it accidentally. Ted is fond of reminding me that there is no bad news for the writer, it is all grist for the mill. 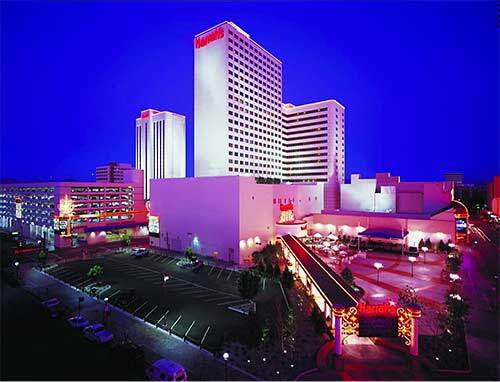 So I’m writing this sitting in a spaciously elegant corner suite on the 15th floor of Harrah’s. 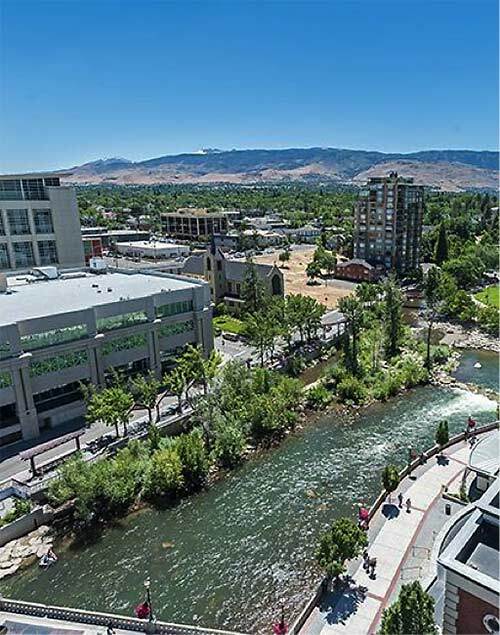 Truckee River thru town The Truckee River, surrounding mountains, and sparkling city lights. The view from the 15th Floor. A baseball stadium next door provided a fireworks display after a game. 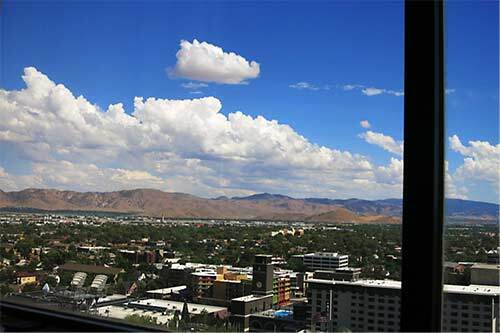 The room is only about $100 a night, and in Reno the restaurant meals are so large that we’ve usually ordered one meal with two plates, and none of the waiters have complained. What an economical vacation! 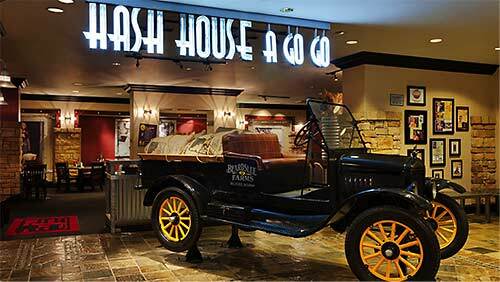 The Hash House a Go Go, with hearty “twisted” farm food and comfy booths, is open until 2 AM. Starbucks, with pastries, fruit, and picnic food. The Ichiban Japanese restaurant where the chef fixes the food in front of you with a number of tricks (tossing an unbroken raw egg into the air and letting it fall onto his knife without breaking in half for example), and plays a concert of clinks with his utensils and chops veggies click, click, click with his sharp knife so fast his hands become a blur. Joy Luck Noodles, which produces an expert but unintentional show. 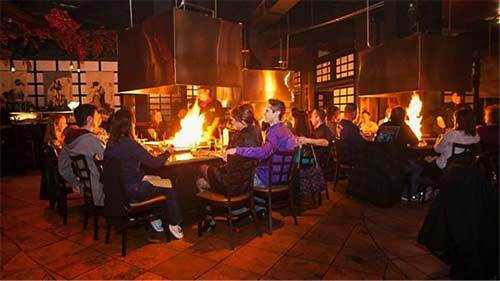 A lone chef with his back to the room uses a conglomeration of humble pots and pans in a lineup about 8 feet wide. He steams vegetables, fries meat, cooks rice, and flips food, flitting back and forth like a speeded up movie, preparing several different kinds of meals with various ingredients at a time. This may be the first stay-put vacation we’ve ever had. 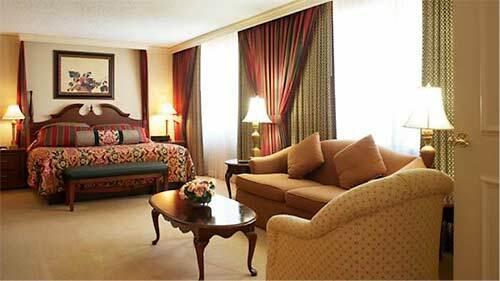 We’re usually exploring new hotels and train routes for the travel agency clients or on a writing assignment somewhere. But this is completely different. No food to fix, no dishes to wash, no phones to answer – precious uninterrupted time to read, to finish various writing projects, gaze out the windows at the clouds, or to phone friends. No unpacking and repacking every day. We’re delighted to find that Reno has two classical music radio stations, and Harrah's provided the high fidelity stereo. We saved Harrah's Steak House tor the last night. It is a special occasion spot. Ted and Sylvia in the Steak House, after a lengthy walk from their room. 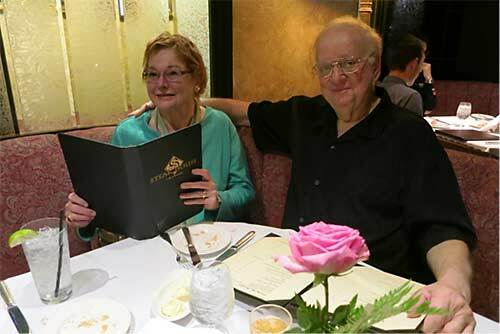 Finding an excellent steak dinner is not easy, but we had high hopes for Reno, and, so far, the food had been excellent in all the hotel’s dining venues. Our expectations were exceeded. 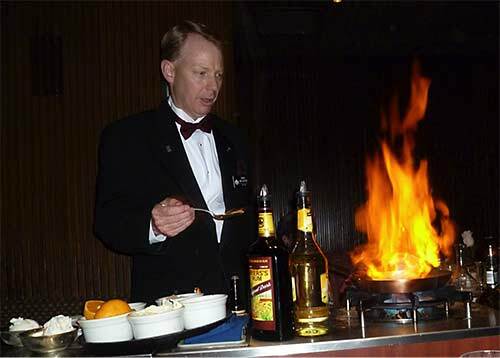 Having sailed on many cruise ships with amazing dining, we would have to rate this restaurant at a 9 out of 10. The reason it wasn’t a ten was the lack of a magazine stand. But it makes sense that the management wants you to gamble rather than read. We had a feeling that we were beating the system—and maybe cheating just a little! By enjoying the views, and staying away from the Casino, we felt the tiniest sense of guilt—kind of like playing hooky at school. The steak restaurant, which we saved for the last night, exceeded our expectations. Away from the hubbub of gambling cacophony, it is located by itself on the lowest level. The table setting, the ambiance, the tuxedoed waiter, the fresh rose, the fine service, the soft music………and the food! Wow! This dessert was exceptional. The waiter at Harrah's Steak House was astonished! This was the best dinner we can recall ever enjoying. Expensive, but absolutely appropriate. A worthwhile splurge ended our do-it-yourself stay-cation. We had hardly needed to step outside the hotel, as it seemed everything we needed was right there. This was a lazy two-week retirement. And we weren’t bored for one minute!